Inside of her kitchen: Mrs. S is an interactive installation/3-dimentional web art about the organic female character that makes frantic efforts to avoid real or imagined abandonment in her kitchen. Mrs. S is a three dimensional creature that has an abstract figure who represents emotional and psychological behavior aspects of borderline disorder. The textures surrounding her body and the space are metaphors for her background and characteristics. Her movements and reactions controlled by the participants using the keyboard/mouse. The interaction of human relationship is one of the central themes of my works. I have been exploring the intimacies and complexities of human personality disorder to portray a range of human conditions. I have observed, seen, met, felt and learned various types of people through relationship and communication. This piece focuses on the individual whose emotional and psychological behavior has been stretched to the limit. Based on my preliminary research about the borderline personality disorder, symptoms are summarized by the following different kinds of aspects: stormy relationship, emptiness, loneliness/fear of being alone, unstable emotion, and inappropriate anger. Mrs. S relationship with others is intense but unstable. This is related to her emotional instability such as mood swings. Emptiness, loneliness, depression, or anxieties are causes for unpredictable and impulsive behaviors. She has fear of being alone despite a tendency to push people away. She shows inappropriate and intense anger or rage with temper tantrums, constant brooding and resentment, feelings of deprivation, and a fear of loss of control over angry feelings. The animations or movements in the space reflect her mind and subconscious. The interaction between the artwork and viewers/participants is my main intrigue. I have been trying to make the conceptual and tangible relationship. Mrs. S is projected on the wall and reacts to the audience’s control. 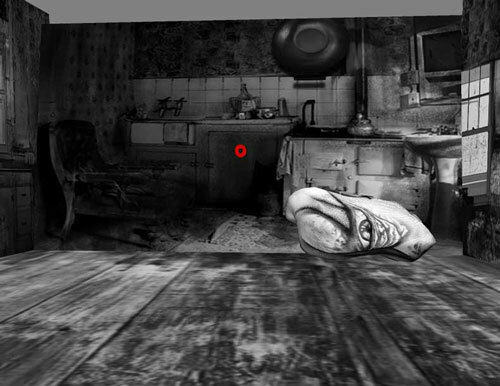 In the kitchen, there are other animations overlapped with Mrs. S which she interacts with. She reacts to the cursor whenever the viewer controls the mouse or keyboard. The scenes are created based on her social cultural background. As they hit the keyboards, they could observe and feel how Mrs. S reacts by that. As she is stimulated by the participants, she is trembling, annoyed, scared, desperate, or lonely. This virtual character and space permits different ways of learning and feeling about the specific characteristics in an emotional and psychological way. Navigating keyboards create a connection between a real and a virtual space.